In this article, I have explained how to load data from multiple Excel sheets to SQL Table or any other destination using SSIS. This can be achieved by using Taks like Foreach Loop Container , Data Flow Task and Components like Excel Source and OLE DB Destination. •	Use name "SampleExcel.dtsx" and press . Select yes to renaming the pack object as well. 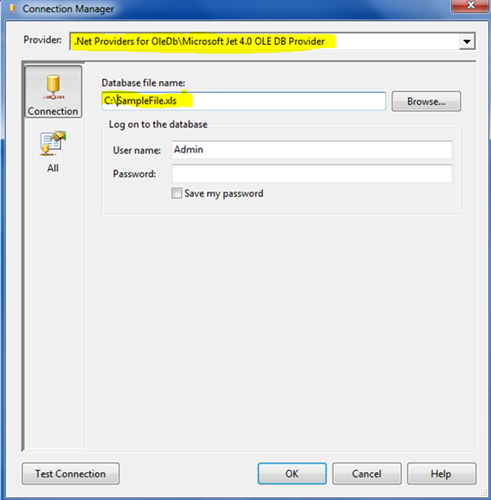 Right click on the connection manager pane and select "Excel Connection Manager"
Right click on the connection manager pane and select "OLE DB Connection Manager"
3. From the Toolbox, Double-click or drag the 'Foreach Loop Container' to the Control Flow canvas. 4. From the Toolbox, Double-click or drag the 'Data Flow Task' to the Foreach Loop Container. 8. In popup window, Expand provider dropdown, and select "Microsoft Jet 4.0 OLE DB Provider"
9. Browse the file which has multiple Excel sheets from which we will load data. 10. Select the "All" tab, go to the "Advanced" tab, and set the Value as "Excel 8.0" for "Extended Properties". 12. Go to Variable Mapping and map the variable to Sheet Name and Set Index from 0 to 2. 13. Double-Click the Data Flow Task OR click the Data Flow tab to open the task. 14. From the Toolbox Double-click or drag the Excel Source to the Data Flow Task. 15. From the Toolbox Double-click or drag the OLE DB Destination to the Data Flow Task. 17. Expand the Data access mode , Select "Table Name or View name Variable"
18. Expand the Variable name. Select "User::SheetName"
21. Run the package, it will load all the data from source Excel sheets to the destination SQL Table. All Excel sheets in the source must have the same structure.